You’ve decided to design for the greater good, but don’t know where to start. You’ve heard that the circular economy is the future, sustainable design isn’t enough, and design thinking has undermined design for “real” designers*. What does any of that mean? Making polarizing statements can get in the way of long-term good. One of the great things about being a creative is how we acquire inspiration from everything we encounter. So it’s not always about something being 100% relevant, but adding new inspiration to our bag of tricks that we can pull from as needed. So let’s add some new terms to that bag! If you feel terrible about anything happening in the world right now and are vowing to do something about it… you, my friend, are a changemaker! A design process that contributes to improving human well-being and livelihood* by embracing ethical, cultural and humanitarian values*. Essentially this is the “I want to improve the lives and experiences of people” lens. Making this the “I want to reduce our impact on the planet” lens. Designing products for people means maybe we should consider the people? A methodology used to solve complex problems and find desirable solutions* through understanding, ideation and implementation. Funny words, activities, and an unsustainable amount of sticky note usage. 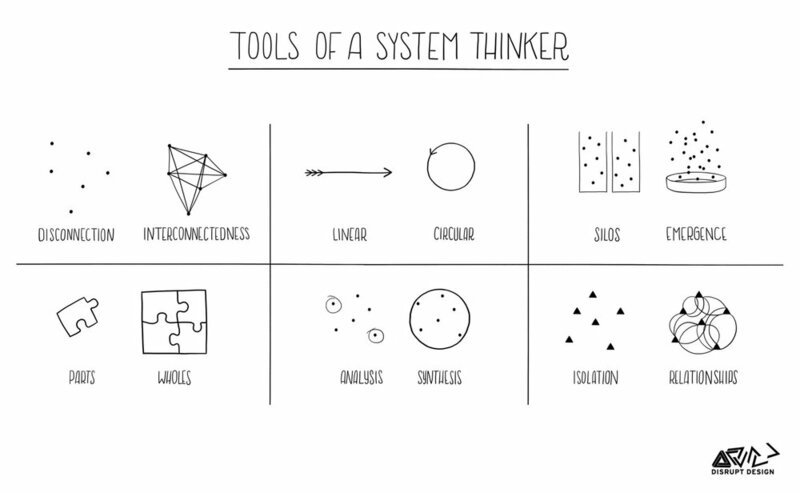 But for real: a set of tools to fuel thinking outside of the box. Umm… nature designed a bunch of stuff already. Like, really well. Earth made it without a landfill for longer than we can comprehend, because waste equals food. We need to take notes. These are not one-size-fits-all solutions. The circular economy is one piece of a large puzzle that will restore our world. Sustainability is especially valuable because of the growing recognition and acceptance by those new to the subject. And design thinking is not originally intended for brand identity projects or ad campaigns, but I’m going to go out on a limb to say that knowing more can only make you a better designer. What’s important is having an understanding of what’s out there, so you can make informed decisions and hold your own when the topics come up. Remember: you don’t need to be an expert in any of these methods or approaches in order for you and your clients to benefit. There is so much to learn. Check out the free resources and find local events and workshops. Then you can apply what makes sense to your specialty and make an impact through your work. Below are some great places to start. There are also endless fascinating timelines and articles found on the web (Medium is a rabbit hole in and of itself).